Alicante province, the most southerly provence of the Valencia region, is one of the most popular tourist destinations in Spain with the Costa Blanca and the well known towns of Benidorm and Torrevieja, plus many more smaller and unique towns such as Calpe, Denia and Javea. The reasons for this popularity are the almost white sands of the beaches (hence the name, Costa Blanca), rugged hills and mountains inland to the north of the province, and the availablity of flights to Alicante airport. For the north of the province, it also has a less parched appearance then coastal areas in Andalucia. The province is also popular with golfers, there being a good selection golf courses along the coastal strip. Towns along the coast will generally offer a wide variety of cuisine, much of it using local produce, while the larger towns will also cuisine from various countrys. The larger towns are also likely to have a choice of water sports available, while inland in the north of the province you will find plenty of walking oportunities. The provence benefits from a fast train service running north from Alicante to Valencia and Barcelona plus regional trains running both north and south. 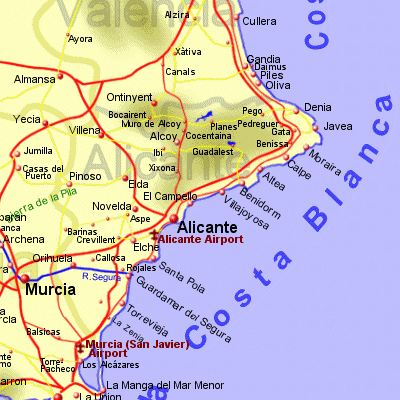 A narrow gauge train also runs north from Alicante city following the coastline as far as Denia.